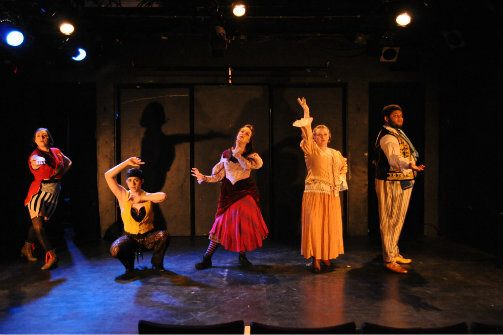 Lily Ali-Oshatz, Thomas Rabuano, Madeline Bugeau-Heartt, Lindsey Ackerman, and Marcus Alexander in The Extraordinary Fall of the Four-Legged Woman. Photo by Bek Ward. BOTTOM LINE: This new musical explores love, “otherness,” and self-acceptance through the eyes of a 19th-century sideshow performer. Like the traveling circuses it evokes, The Extraordinary Fall of the Four-Legged Woman quickly sets up shop, draws us into its winsome, vaguely disturbing world, then dismantles, leaving behind only fading melodies and hazy comprehension of what we’ve seen. During her troupe’s stint in a small Arizona town, Myrtle meets, and falls in love with, the charmingly earnest Bicknell, who frequents the circus each night hoping for a glimpse of her. While his intentions seem pure, Myrtle cannot determine whether this interest stems from genuine love or perverse medical fascination. The nature of her profession only compounds these fears: like such fellow “freaks” as the hermaphroditic Simon-Elizabeth (Thomas Rabuano) and burlesque dancer Lola (Lindsey Ackerman), Myrtle’s abnormality is alternately fetishized and reviled, her body displayed as both object of desire and twisted oddity. While Myrtle has found solidarity and acceptance amongst the sideshow’s misfits, these bonds can be as constricting as they are supportive; it’s unclear whether charismatic ringmaster “M” (writer Lily Ali-Oshatz) is providing refuge for these ostracized souls or exploiting them for her own profit. When Bicknell proposes, Myrtle must choose between remaining in the circus’s insular community or following her heart into the potentially-hostile outside world. Four Legged-Woman’s music is its clearest strength: accompanied only by a tuning kazoo, the small cast weaves stirring harmonies with the finesse of a professional a capella group. Yet, this choice occasionally backfires, leaving periods of dead air onstage; a little pre-recorded accompaniment or background music might ease some transitions and create a stronger stylistic throughline. Additionally, Ali-Oshatz’s plot touches on some complex issues—gender fluidity, the curation of identity, public representation of unconventional or marginalized bodies—which beg for deeper exploration than a forty-five-minute run time can offer. I’d love to see an extended version of the piece giving these concepts, and Myrtle’s history, the weight they’re due. Nonetheless, Four-Legged Woman’s unorthodox love story offers us a tantalizing peek behind the big-top’s curtains, revealing the darkness underneath each spectacle and the humanity in every “freak." The Extraordinary Fall of the Four-Legged Woman is written by Lily Ali-Oshatz and directed by Madeline Wall. Presented by Flights of Fantasy East. Composer/Lyricist/Writer is Lily Ali-Oshatz. Producer is Erica Rose. Music Arranger and Director is Mark Galinovsky. Choreographer is Kory Geller. Stage Manager is Charles Hayes IV. Designer is Michelle Rickert. Lighting Design is by Elizabeth Stewart. The cast is Madeline Bugeau-Heartt, Justy Kosek, Lily Ali-Oshatz, Lindsey Ackerman, Marcus Herndon, and Thomas Rabuano.